Dewey Beach's Rusty Rudder was forced to close early after a fight erupted inside the landmark restaurant early Sunday. Dewey Beach police first radioed for additional officers around 12:50 a.m., and the request was made for canines from the state police and Rehoboth Beach to assist with crowd control. About 25 minutes later, Rehoboth's canine officer radioed back to Rehoboth for assistance. "Just get us some people. It's getting out of hand down here," Cpl. Jamie Riddle said. "We need lots. We need as many units as we can get. It is way out of hand." In the background one could hear dogs barking and people yelling. State police as well as Rehoboth and Lewes police responded to assist. Apparently more fights started outside the restaurant. Police shut down the intersection to incoming traffic in an effort to get patrons out of the Rudder lot as quickly as possible. Police dogs helped scare off the 150-200 disorderly patrons. Police arrested two local men. Several officers suffered minor scrapes and bruises, but no ambulance was requested for any injuries. It took about an hour to clear the crowd from the property. Sgt. Clifford Dempsey sent out this news release Sunday morning. Rehoboth Beach police received a call reporting a swimmer "approximately a mile out" off Wilmington Avenue around 7:40 p.m. Friday. The police dispatcher said "They said he appears to be in distress, although I know we get this swimmer at least once a week. [He] goes out pretty far." Rehoboth Beach firefighters and Sussex County paramedics responded to assist after police received additional reports. The firefighters watched the man swim north, and reported that he "doesn't seem to be in any distress, [but] he stops once in awhile and bobs up and down." The state police helicopter, Trooper 2, was already heading toward Rehoboth, and the Coast Guard and Lewes fire boat were just about to deploy. But the man came ashore in the Deauville area around 8 p.m. Moments later he was greeted by a fire department official, and brought to Surf Avenue to meet the police shift supervisor. The Russian exchange student supposedly promised to inform the police beforehand when attempting the off-shore swim in the future. Ironically, about an hour earlier, Ocean City officials responded to a similar incident at 13th Street. Police received a call from the Phillips By The Sea management reporting a female swimmer possibly in distress. She was reportedly out of the water as firefighters arrived. They speculated that she was the same woman who swims along the beach each day. They took her to meet the caller to confirm that she was indeed the swimmer they were watching. Saturday was a challenging evening for officers working the DUI checkpoint which was set up in the west-bound lanes of Rehoboth Avenue between the circle and the drawbridge. Rehoboth Beach Police Chief Keith Banks participated in the checkpoint. Shortly after it got underway late Saturday night, he said the traffic was heavy and they had to let traffic flow for up to an hour. That's when it started raining. But officers donned raincoats in addition to their safety vests and remained on the street (below). 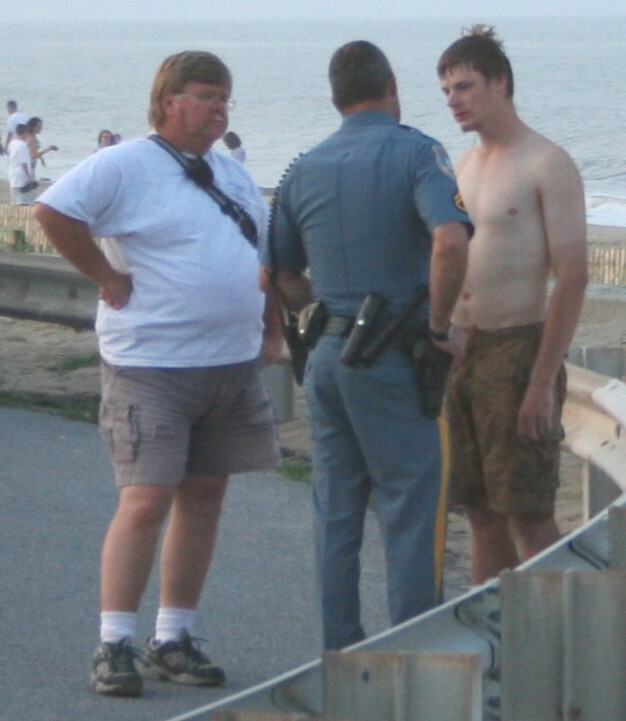 For about 45 minutes several of the officers left to assist Dewey Beach police with the Rusty Rudder disturbance. But the officers returned to the checkpoint around 2 a.m.
Chief Banks says officers stopped a total of 276 vehicles. They had two seatbelt violations, one expired registration, and cited one driver for no insurance. But no DUI arrest, although two drivers were detained for further investigation. They were later released. Amazingly the fish survived, but the owners of the Lighthouse Inn Bed & Breakfast on Delaware Avenue are frustrated by recent vandalism. 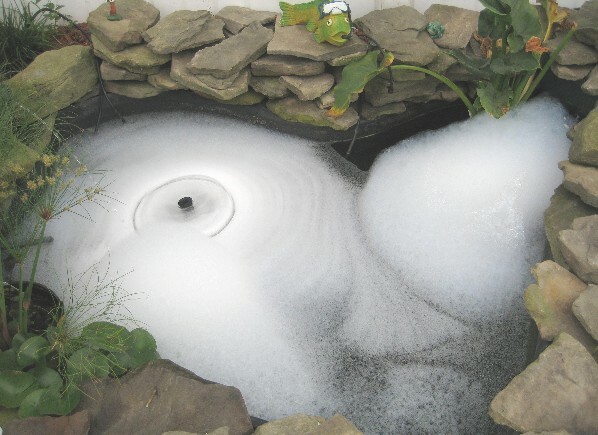 They woke Friday to discover that somebody poured liquid soap in their fishpond. Fortunately they were able to save the fish. The vandals struck between 11:30 p.m. Thursday and 7 a.m. Friday. The B&B also had its flag stolen about a month ago when it was ripped from the wall. Perhaps it's a coincidence -- maybe not -- that Rehoboth Beach bike thefts are way down this season and the number of exchange students are as well. As of Tuesday morning, the police department had 15 reported bike thefts as opposed to 28 that day last year. Police Chief Keith Banks says the bikes that are being stolen typically are not locked. But why the decrease? Det. Kevin Jones says his theory is that it is related to the decrease in the number of foreign students here this summer. Before the Ocean City Beach Patrol reported for duty Friday morning, surfers pulled a fellow surfer from the ocean near the Hilton Suites on 33rd Street. Several lifeguards were already on the beach and assisted with treatment when it was reported around 7:40 a.m. "We had staff getting reading for our early morning Junior Beach Patrol program," says Kristin Joson, OCBP spokeswoman. "Two of our Crew Chiefs were able to respond on quad [ATV]." The surfer was in cardiac arrest and they performed CPR while waiting for EMS. He was taken to Atlantic General Hospital in grave condition. Beach Patrol Capt. Butch Arbin says the man may have suffered a spinal injury. Witnesses observed the surfer fall off in shallow water. Capt. Arbin said he does not believe the man survived. Initial witness statements made it sound as if he bailed out after a ride and may have struck the bottom and sustained a neck injury but later reports suggested he had suffered an aneurysm and later died. [Getting medical updates these days from hospitals is often difficult because of HIPAA laws]. 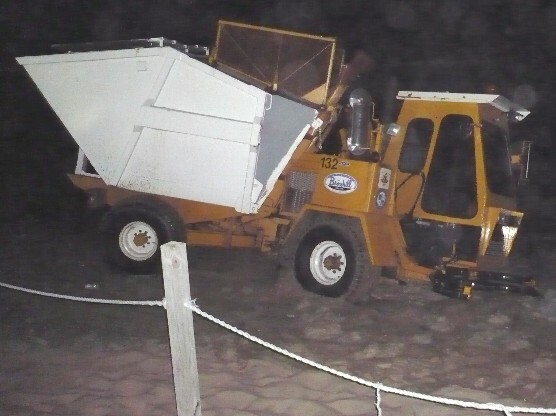 An Ocean City trash truck drove into a ditch and became flooded on the beach Thursday night during a storm surge. Water covered the beach and concealed the ditch dug in the sand by children earlier that evening. Waves at high tide around 9 p.m. brought water to the dunes in front of the Sea Watch at 115th Street. 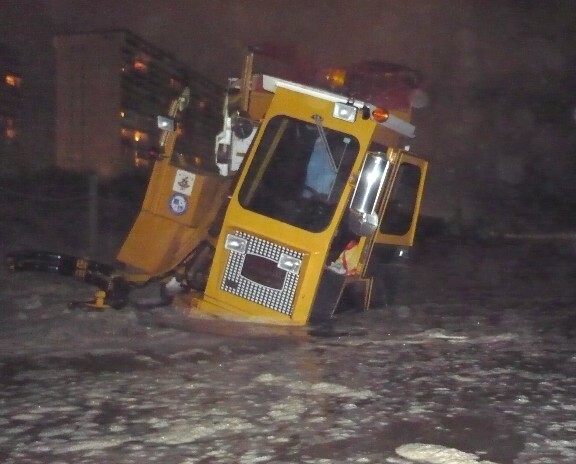 A tractor was called to help remove it from the water. The Atlantic coastal storm Thursday flooded the beaches in Ocean City and Bethany. OCEAN CITY'S "LIFEGUARD" RODNEY COMES TO D.C. But, is he really a lifeguard? Ocean City has been promoting a lifeguard named Rodney in its advertising for the resort town. 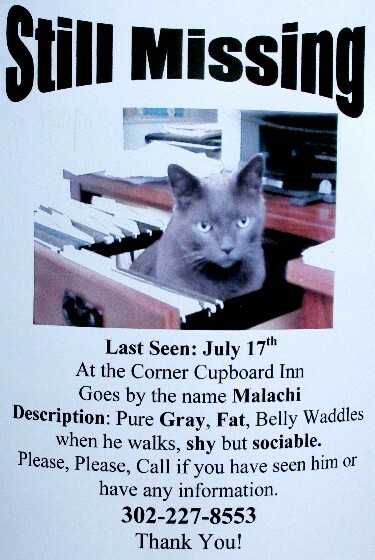 It's "his job to save people from boredom," the ads proclaim. But is this lifeguard actually a member of the Ocean City Beach Patrol? Capt. Butch Arbin says Rodney is actually an actor out of New York. He did a casting call along with several others and was chosen to play the role. Rodney did the commercials last summer and has made personal appearances starting this June. He will be in the Washington, D.C. area this week! On Thursday (July 30) Rodney will appear at Caribou Coffee in Crystal City at 2100 Crystal Drive between 11:30 a.m. and 1:30 p.m. The city will offer drawings for an Ocean City getaway and other prizes. The Rehoboth Beach Homeowners' Association held its annual meet-the-candidates forum at CAMP Rehoboth Thursday evening. The RBHA has posted an MP3 audio recording of the forum here on its Website. 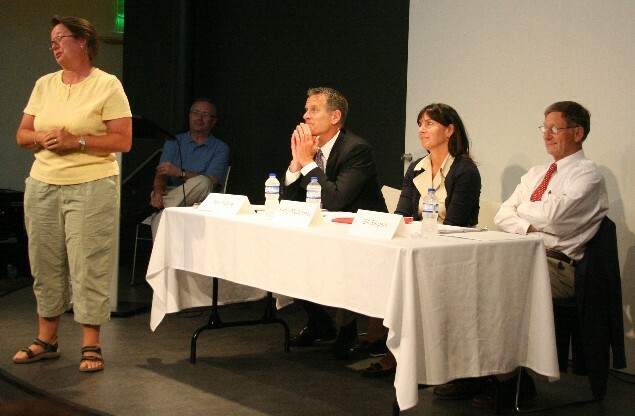 Shown below are Linda Kauffman, RBHA president, Steve Elkins of CAMP Rehoboth who was the moderator, and the three candidates, Commissioners Paul Kuhns and Kathy McGuiness and challenger Bill Sargent. It was attended by about 50 people total. With just 12 more days left until Election Day, we're still searching town for the street, or streets, whose campaign sign count will correctly predict the winners. Last week we counted the properties displaying signs on Hickman Street and Columbia Avenue. This past Thursday, we counted all of Park Avenue and all of Laurel Street! If a candidate had more than one sign on a property, it was counted only once. But if two different candidates had signs on the same property, both were included in the totals. LAUREL STREET--- A total of 10 properties displayed campaign signs, seven for Commissioner Paul Kuhns and three for challenger Bill Sargent. PARK AVENUE--- A total of seven properties displayed at least one campaign sign. Bill Sargent had seven, Commissioner Kathy McGuiness had two, and Commissioner Paul Kuhns had one. Several properties on this street had signs for two of the three candidates. As in past years, the candidates who are allied with Save Our City dominate the northern streets in town. Next week we will sample two more streets! Wednesday was the Fourth Annual Wine Tasting & Art Auction to benefit KINfolk. KINfolk is a special organization with a unique goal: Provide computers and Internet access to children whose lives have been disrupted by disease and injury. The organization has another fundraiser planned for Wednesday, July 29, at the Shag Restaurant, 37 Wilmington Avenue in Rehoboth Beach between 5 p.m. and 1 a.m. The restaurant has pledged to give 20 percent of the evening's food proceeds to KINfolk. People who would like to contribute can also purchase a raffle ticket from Rehoboth celebrity Cheryl Blackman (wearing the white cap), or visit the organization's Website. To her left is Kathleen McNamara, secretary of the KINfolk board of directors. They both volunteered during Wednesday's wine tasting and art auction. 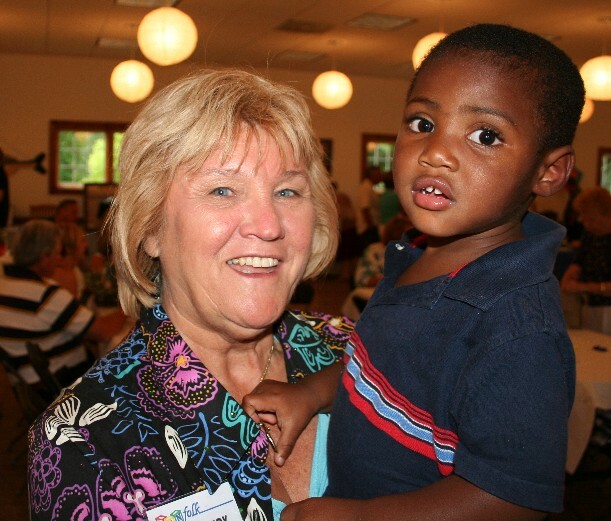 The Honorable M. Jane Brady, below, is the KINfolk honorary chairperson. Judge Brady sits on Delaware's Superior Court. Saturday night was the annual Rehoboth Beach VFC's fundraiser at Aqua Grill on Baltimore Avenue. They are raising money for a new firehouse on Coastal Highway. See the fire company's Website for more details. WORKER AMPUTATED FINGER TIPS--- A 43-year-old man had the tip of his middle finger amputated and part of the tip of his index finger. The accident happened around 2:30 a.m. Friday at the Pinnacle Foods plant which is between Dagsboro and Millsboro. It involved machinery with a pulley and a belt. He was taken to Beebe Hospital. MAZDA REPORTED STOLEN FROM NORTH SHORES--- The state police were reporting Saturday that a 1995 Mazda Miata was stolen from Rolling Road in North Shores between 9 p.m. Friday and 10 a.m. Saturday. The car is royal blue with a black top. Keys were reportedly left inside the car. WALL COLLAPSES AT PACIFIC SUNWEAR--- A non-load-bearing wall gave way at the Pacsun store in the Tanger Outlet bayside mall around 6:10 p.m. Saturday. Firefighters discussing the incident over the radio said it was a display wall that had too much weight on it. Electrical fixtures and wires inside the wall were damaged. To complicate matters, firefighters had trouble accessing the electrical panel box because of "display stuff" in front of it. They also had trouble removing the electrical meter because of obstructions. A fire marshal was requested to investigate. There were no injuries. REHOBOTH BEACH POLICE INVESTIGATE SUSPICIOUS PERSONS--- Rehoboth Beach police received a report of about five young men coming in and out of yards on Stockley Street near the elementary school around 1:10 a.m. Sunday. When an officer arrived, the males took off running. Chief Banks, who was working at the time, said they got away, but there was no sign of any criminal activity. About 25 minutes later, police responded to Munson Street near State Road for the report of six males possibly trying to remove tires from a vehicle. The caller had startled the men and they fled before police arrived. 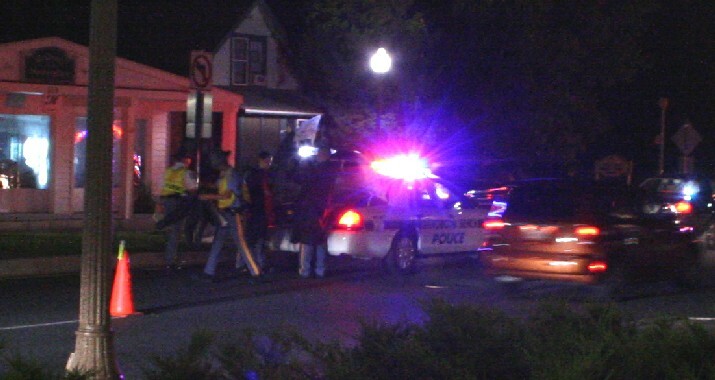 CORRECTION ON LAST MONDAY'S REHOBOTH 7-ELEVEN INCIDENT--- Rehoboth Beach Police Det. Kevin Jones says the incident at the Rehoboth Beach 7-Eleven was apparently some type of fight, NOT a robbery. It was reported around 3:30 a.m. Monday. UMBRELLA INJURIES--- Two boys were injured this weekend in separate incidents involving fly-away umbrellas. A 13-year-old was bleeding from his head after an umbrella struck him around 3:35 p.m. Sunday at 2nd Street in Bethany Beach. Although his injuries were not serious, an ambulance was called to treat him. Rehoboth Beach Patrol treated another boy injured by an umbrella on Brooklyn Avenue around 12:20 p.m. Saturday, but no ambulance was requested in that case. FIRE IN HAPPY JACK PANCAKE HOUSE--- Ocean City firefighters responded to the Happy Jack Pancake House at 2504 Philadelphia Avenue around 10:15 p.m. Saturday. Smoke was reported coming from inside and outside the restaurant. Firefighters confirmed the smoke, but had a difficult time locating the source. They suspected it started in the kitchen. Traffic was affected on both Philadelphia and Baltimore avenues. BETHANY AMBULANCE INVOLVED IN PROPERTY DAMAGE ACCIDENT--- A Bethany Beach ambulance was involved in an accident on north-bound Coastal Highway on the Rehoboth canal bridge around 5:20 p.m. The crew was taking a 41-year-old man to Beebe Hospital after he was injured while riding a boogie board. Another ambulance responded to take him to Beebe Hospital while police took a report. There were no injuries. CRASH SHUTS DOWN ROUTE 24--- A two-vehicle accident closed John J. Williams Highway at Mulberry Knoll Road around 3 p.m. Saturday. The only patient taken to the hospital was a 67-year-old man who was driving an SUV that overturned. He had been wearing a seat belt and only suffered a cut to the head, and was complaining of some head pain. The roadway was closed for about 40 minutes.